Elvis Presley and his Guitar … Player or Pretender? Was He a Player or a Pretender? The photograph on his first record album in 1956 shows Elvis Presley immersed in a rock ’n’ roll moment—eyes closed, mouth screaming, legs spread apart, and a right hand, almost in a fist, about to deliver a blow to six defenseless guitar strings. It’s an iconic image, with the guitar, the enduring rock instrument, at its center. But is the photo an honest depiction of the young Elvis Presley? The soon to be anointed “King of Rock ’n’ roll” certainly had the pipes to wear the crown, but did he have the ability to handle rock’s most fundamental tool? 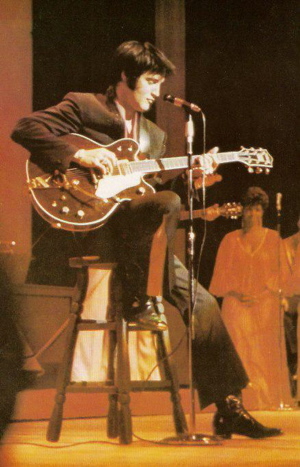 Could Elvis Presley really play the guitar, or was it just a prop in his rock ’n’ roll act? As a toddler, Elvis began singing in church, and kept it up on other days of the week into his early years in school. 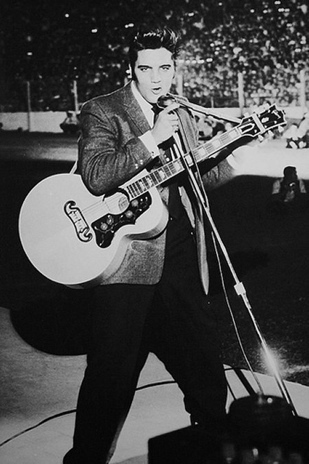 Vocally, Elvis had some natural talent that became apparent to his schoolmates in his teen years. Blending the sounds of the country vocalists, white crooners, and black rhythm and blues artists that he heard on the radio helped him develop the unique vocal sound that would make him famous. 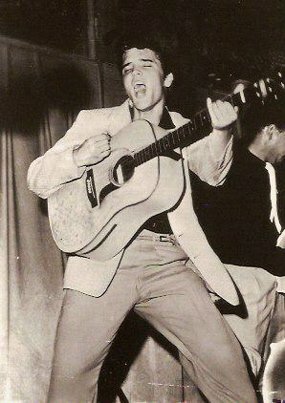 Young Elvis did not have a similar natural ability when it came to playing the guitar, though. 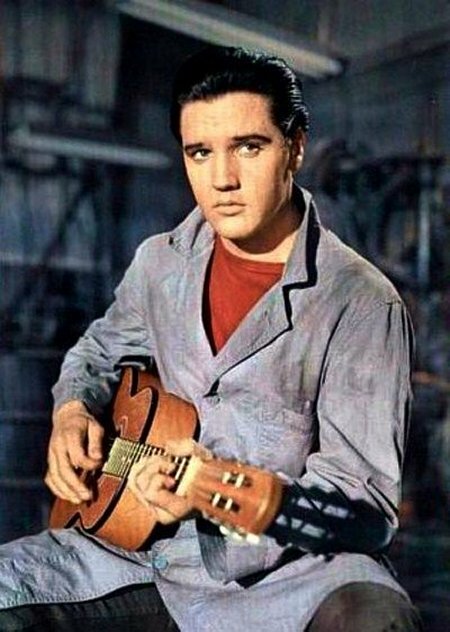 That first guitar, described by one of his first instructors as a “little, itty-bitty, Gene Autry-type guitar,” became young Elvis’s constant companion, physically as well as musically. A beginner’s book introduced him to the concept of chords, but he needed some instruction from real guitar pickers. After the Presleys moved to Memphis, Jesse Lee Denson, son of a family friend, also gave Elvis some instruction. 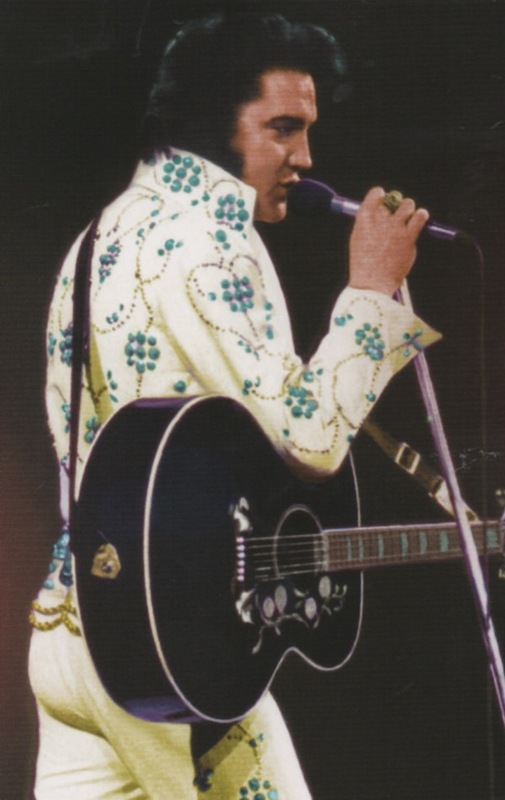 In Peter Guralnick’s Elvis biography, Jesse remembered Elvis’s first guitar. Elvis’s high school classmate Red West told Guralnick a story that demonstrated how important Elvis’s guitar was to him then. 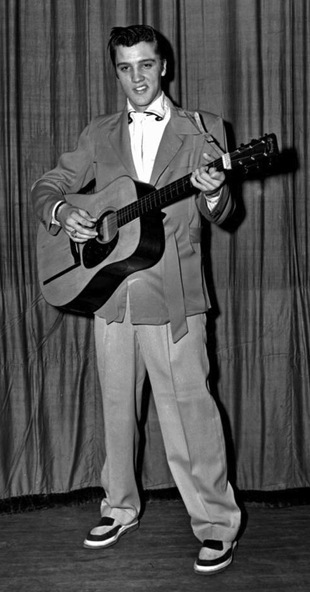 A couple of months after graduation in 1953, Elvis used his fundamental guitar skills to accompany himself recording “My Happiness” and “That’s When Your Heartaches Begin” for his mother at Sam Phillips’s Memphis Recording Studio. It was the voice, not the guitar playing, that the receptionist later recommended to Sam. That led to Elvis, Scotty Moore, and Bill Black meeting at Scotty’s house on July 4, 1954. Scotty’s wife Bobbie recalls seeing Elvis coming up the walk. “He had on a white lacy shirt, pink pants with a black stripe down the legs, and white buck shoes. 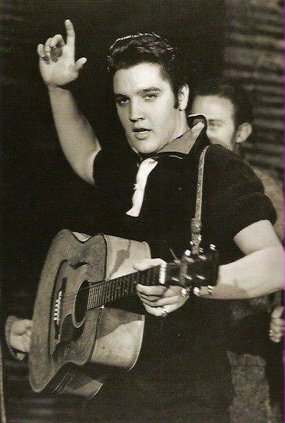 He was carrying a guitar.” Neither Scotty nor Bill was impressed with either Elvis’s singing or playing, but they later agreed to try recording something with him at Sam’s studio. And so The Blue Moon Boys were born—Scotty playing lead, Elvis pounding the rhythm, and Bill slapping the bass. 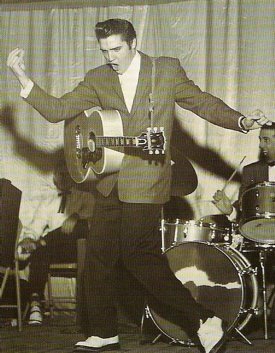 Elvis played guitar on all eight of the trio’s Sun recording sessions in 1954-55. “With only the three of us, we had to make every note count,” Scotty said. That applied not only to the studio but also to the dozens of personal appearances The Blue Moon Boys made over the next year and a half. Scotty and Bill helped Elvis learn how to handle his guitar on stage. “They coached him on how to hold his guitar and do all this stuff in front of a mike,” explained Bill’s wife Evelyn. That need to have a guitar at hand in the studio came up again when Elvis’s first post-army recording sessions approached in 1960. When Scotty Moore was at Graceland soon after Elvis returned home from the army, Elvis complained about how ragged his old J-200 guitar looked. 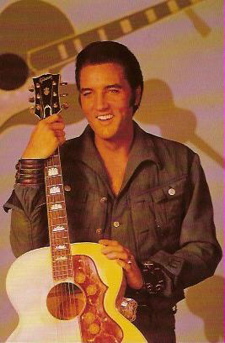 Scotty used his endorsement deal with Gibson to order Elvis a new one. In a letter accompanying the order, Scotty instructed, “I would like for you to do some extra inlay work on the front, nothing too elaborate, something a little different possibly that he would like very much. I will leave the design of this to your discretion.” The new guitar was shipped to Nashville in time for Elvis’s session there. In the 1960s, Elvis was seldom listed as a guitar session player in that decade’s RCA and movie soundtrack recording sessions. 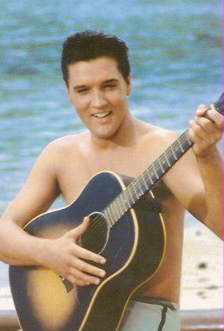 He was credited for the 1960 “Elvis Is Back” and 1961 “Something for Everybody” sessions, but after that there was no Elvis Presley credit as a guitar musician for 25 straight recording sessions from 1961 through 1967. 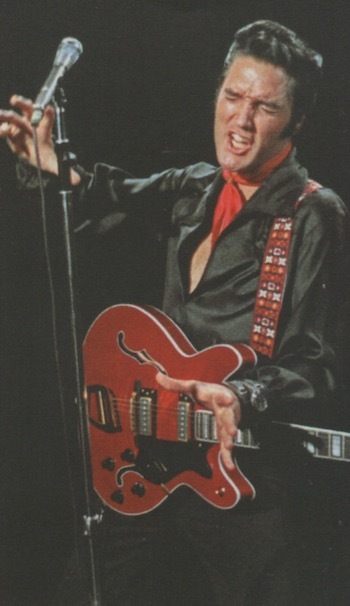 However, there was one more classic Presley guitar moment in his career. 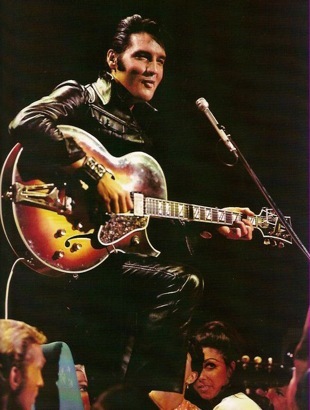 Elvis asked Scotty Moore to participate in the memorable “sit-down” jam session for Presley’s 1968 NBC-TV special. Dickerson relates Scotty’s story of what happened. Also on the stage was drummer D. J. Fontana. He continues the story. So, was the King of Rock ’n’ Roll a real guitar player, or just a pretender wielding a prop? Either way, the perception lives that he was, and they say “perception is reality.” For me, it all goes back to what James Dickerson wrote about the young Elvis Presley strumming his guitar on his front porch in Memphis. 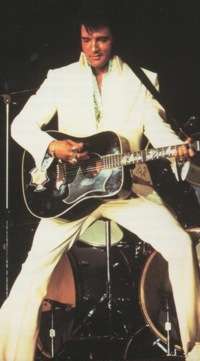 "Despite his limited ability, Elvis Presley’s guitar work was the key component in that first recording. His playing inspired Scotty and Bill to join in. 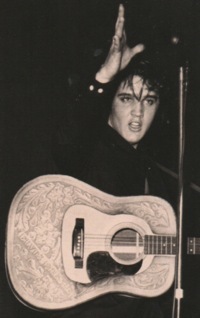 Scotty later noted, 'Elvis didn’t know all that many chords, but he had a great sense of rhythm.'"